As a new audio format, the compact disc in the early days was targeted primarily for audiophiles, those who wanted uncompromised sound (“Perfect Sound Forever”, no snap, crackle, pop). (Whether the CD delivered that can be debated until the cows come home and will not be debated here.) Many record labels focused their efforts around the fledgling digital medium on the genre of classical music, believing that audiophiles and those that could afford the new format had a refined palate and were classical music aficionados. Examples of such labels include CBS/Sony, EMI, Philips, and Nimbus. Another one, which is the focus of this post, was Delos. Delos jumped on the CD bandwagon in the U.S. around 1983. Their earliest titles bear catalog numbers of the form D/CD 3XXX. For later titles, the catalog number prefix changed from D/CD to DE. Early titles released by Delos were pressed in Japan. Most of these discs were pressed by Sanyo, but a handful of early titles were pressed by CBS/Sony. 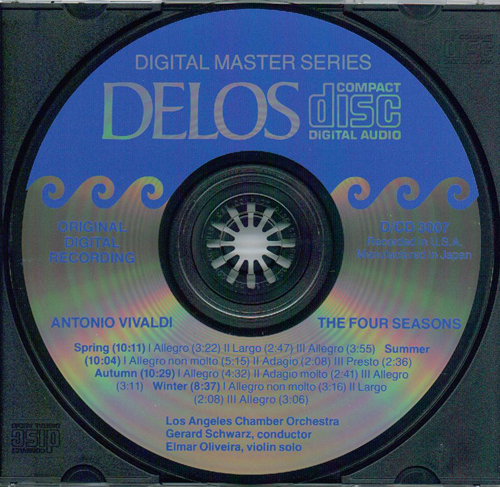 By 1985, Delos titles were being pressed in the U.S.
One of the few Delos titles pressed in Japan by CBS/Sony is Antonio Vivaldi’s The Four Seasons performed by the Los Angeles Chamber Orchestra with Gerard Schwarz as conductor. This recording features Elmar Oliveira on violin. 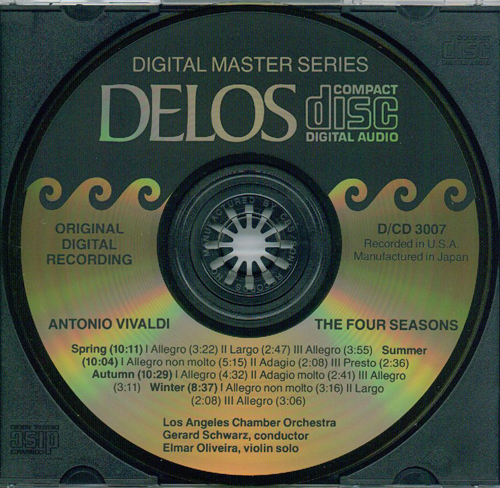 Delos released this version of The Four Seasons under catalog number D/CD 3007. Here we consider two CBS/Sony pressing variations of The Four Seasons. The two pressing variations of The Four Seasons are found with identical inserts. As an early Delos release, there is no barcode on the back insert, and the inserts were printed in Japan. Although we are talking about an early release in general, early is relative. We will distinguish the two CBS/Sony pressings of The Four Seasons by classifying one as earlier and one as later. The difference between the two CBS/Sony pressings is obvious upon inspection. For the earlier one, the aluminum portions of the label side have a gold tone. The play side has the conventional aluminum color. While this may seem unusual, CBS/Sony released its earliest classical, jazz, and rock titles in Japan in 1982 with a gold tone on the label side. It would therefore appear that the earlier CBS/Sony pressing of The Four Seasons on Delos was pressed in ’82. This disc has the text “MANUFACTURED BY CBS/SONY RECORDS INC.” stamped on the clear plastic ring at the center. The matrix code character grouping also represents an early format. The matrix code is “D/CD-3007-1 1A1”. The top portion of the disc label has a black paint coating with the Delos logo in “aluminum”. For the later CBS/Sony pressing, the aluminum portions of the label side are the conventional aluminum color. This disc has “CSR COMPACT DISC” repeating in the clear plastic ring. The matrix code character grouping is more conventional for Japanese CBS/Sony pressings. The matrix code is “D/CD 3007 11A2”. The top portion of the disc label has a blue paint coating instead of black, with the Delos logo in “aluminum”. Shown below are the front and back inserts found with the two Japanese CBS/Sony pressings of The Four Seasons. The two pressings are also shown for direct comparison. The cover for Japanese CBS/Sony pressings of Antonio Vivaldi The Four Seasons performed by the Los Angeles Chamber Orchestra, conducted by Gerard Schwarz (Delos, catalog number D/CD 3007). The back insert for Japanese CBS/Sony pressings of Antonio Vivaldi The Four Seasons performed by the Los Angeles Chamber Orchestra, conducted by Gerard Schwarz (Delos, catalog number D/CD 3007). There is no barcode. As noted in the bottom right corner, this insert was printed in Japan. 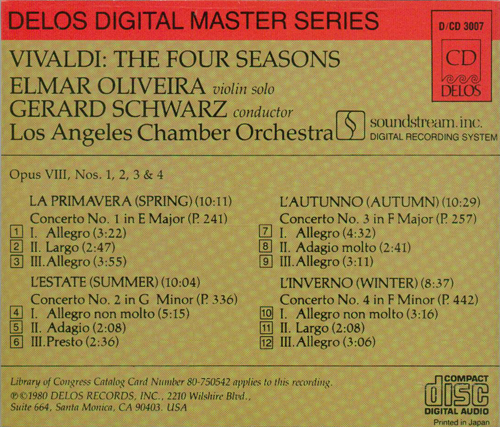 The earlier Japanese CBS/Sony pressing of Antonio Vivaldi The Four Seasons performed by the Los Angeles Chamber Orchestra, conducted by Gerard Schwarz (Delos, catalog number D/CD 3007). “Manufactured in Japan” is printed at 3 o’clock. Note the gold tone, which is similar to the gold tone found on the earliest CBS/Sony CDs released in Japan in 1982. This disc has “MANUFACTURED BY CBS/SONY RECORDS INC.” stamped on the plastic ring, and the matrix code is “D/CD-3007-1 1A1”. Note the black paint coating at the top. 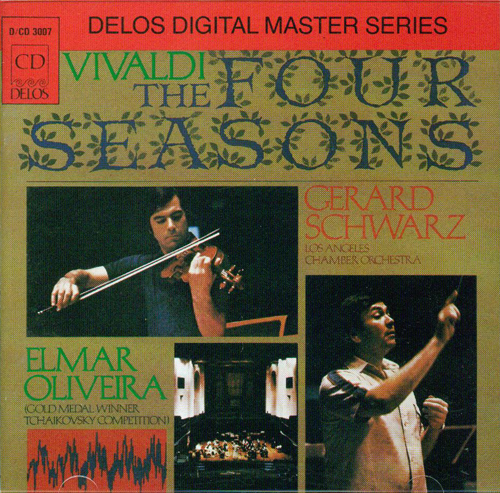 The later Japanese CBS/Sony pressing of Antonio Vivaldi The Four Seasons performed by the Los Angeles Chamber Orchestra, conducted by Gerard Schwarz (Delos, catalog number D/CD 3007). “Manufactured in Japan” is printed at 3 o’clock. This disc is the conventional aluminum color. It has “CSR COMPACT DISC” repeating in the plastic ring, and the matrix code is “D/CD 3007 11A2”. Note the blue paint coating at the top, compared to the black coating on the earlier pressing above.